Article - Are you a Secret Survivor? To continue to live or exist, esp. after coming close to dying or being destroyed or after being in a difficult or threatening situation. If you survive someone, esp. a member of your family, you continue to live after they have died. A survival is something that has continued to exist from a previous time. A survivor is a person who continues to live, despite nearly dying. A survivor is also a person who is able to continue living their life successfully despite experiencing difficulties. After reading this definition I came to the conclusion that whilst survival was better than perishing it didn�t offer much by way of quality of life. We hear people boasting about �being a survivor� and I think there are many more survivors out there than we would care to believe. Are you a secret survivor? Wake up each morning with a smile on your face as you leave home, looking forward to another stimulating day at the office? Do you head home each night feeling that you have really achieved something useful? Do you feel seen, and appreciated for who you really are? Is it some time since you last had a real (defined as one where you exchanged information honestly and allowed your true feeling to be seen) conversation with someone at work? If you didn�t have to, would you still go into work tomorrow? Would anyone notice or care if you or your company ceased trading? If you can�t answer these questions with a resounding "Yes" then maybe you are a secret survivor too. Evolution has a lot to answer for. Imagine the picture; your ancestors are out in the savannah some 25,000 years ago surrounded by all manner of creatures bigger than them, stronger than them, faster than them, hungrier than them! They must have felt very small and very naked (compared with the beasts with their thick, warm pelts or armour plating.) I wonder if we have really come that far? Was it the big, brave trusting specimens of homo sapiens that survived to pass on their genes or the ones who ran away on the off-chance that sabre toothed tiger was hungry? Lady Evolution gifted us with only two potential responses when faced with a threat, we either run away (Flight); or if we have no choice, or think we are big enough and tough enough, we attack (Fight). The fight / flight response is a basic survival tool and we all have it. The fact that there are relatively few sabre-toothed monsters in our modern world doesn�t make it one whit less powerful. 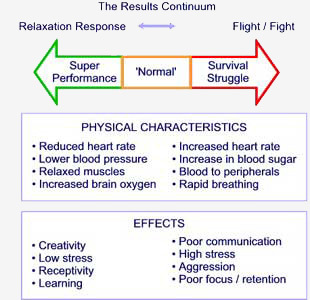 So what is the physiological effect of the flight / fight response? 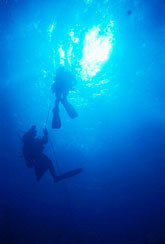 It prepares us for rapid and dramatic action. It shuts down the blood supply to all non-essential organs (such as the brain. We don�t need to think, just RUN) and sends it to the main muscles. It secretes adrenalin which metabolises sugar to release energy. Our breathing becomes shallow, we sweat (as our muscles warm up). You may have noticed some of these symptoms round your board table.. you may even have felt them yourself. You can not reason with someone in this state, they literally can�t hear you. Innovation and conceptual thinking are impossible. Because evolution takes thousands of years to adapt a species (especially one that takes as long to breed as we do,) our bodies� responses are lagging thousands of years behind the realities of the modern jungle that we now inhabit. There has been more profound change in our ways of living in the last 200 years than in the preceding 20,000. The fact that we talk a lot about the importance of change and innovation doesn�t mean that we are able to cope with it. In our secret hearts most of us believe that change is pretty good medicine� for others to take, but we don�t need any, no sirree! So are we doomed to live out the lives of our cavemen ancestors in our silicon palaces? Luckily the answer is "no", but that does mean that we have some work to do. Our minds are capable of incredible leaps, hence the progress we have made in the last 100 years. There is another physiological response, the benign opposite of Flight / Fight called the Relaxation Response. It is less well known, but has been studied for thousands of years by Indian gurus and has now been described and studied by scientists. In this state the brain produces alpha and theta brain waves (these are associated with �super� learning, insight and creativity). In this state the brain is flooded with oxygenated blood, muscles relax and the blood pressure drops. Look at the following chart and decide in which state you would sooner live. The importance of moving to the left of the Results Continuum is that not only will we be more happy and relaxed, but also more healthy and prosperous, as we access more of our potential and use it more creatively. Estimates vary but scientists agree that we use at most 15% of our brain, some think that it is nearer 1%! Plenty of scope for improvement, eh? If you had any other asset that was only being exploited to 10 % of it�s capacity wouldn�t you want to do something about it? I bet you have heard the phrase "Our people are our greatest asset!" or "We are in the People Business" as often as I have but how can anyone be serious about this and do nothing to ensure that these assets are used in a way that makes them more valuable and productive? We all know that happy staff are more productive but how many do you have? Are you happy? You can train yourself and your team to recognise when your Flight / Fight mechanism is triggered and you can help each other out of it. By understanding the importance of these physiological and psychological states and learning how to recognise where you are on the continuum you can help each other to move towards the productive left of the scale. In order to do this you must build up some trust in each other and learn to really listen and observe. It is also useful to start to use a common �language� that helps people talk about this difficult area with less sense of threat. There are a number of tools and technologies out there that allow you to progress in this day-to-day challenge to live your life fully, but in order to avail yourself of them you must first admit that you need some help. Check your diet. Your body needs the right fuel to function. Fill it with junk and that stresses it (and you.) Would you put dirty paraffin into your brand new BMW? Listen to what others say�. Note what they don�t say. It is often more important! "That�s what alchemists do. They show that, when we strive to become better than we are, everything around us becomes better, too." Take a lead and start behaving in the way you would like others to behave, and KEEP DOING IT! Set some ground rules about what sort of behaviour you want. Get in an expert facilitator to ensure that they are followed. This creates the safe space which allows change to take place. Good luck on your journey from surviving to thriving!